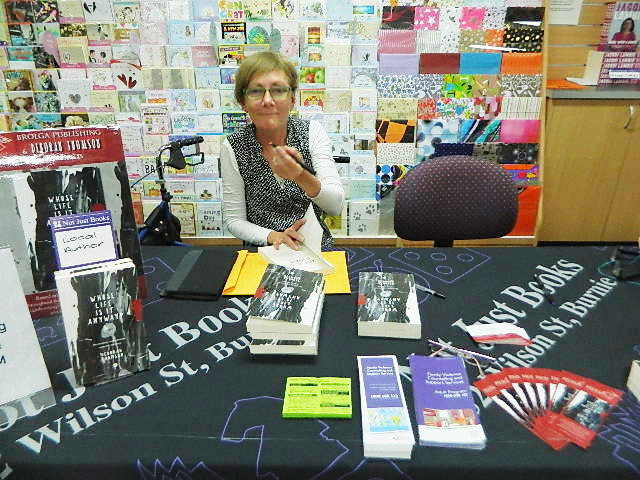 Mal Walden to be on the speakers panel at Bayside Literary Festival – 27 May 2018! 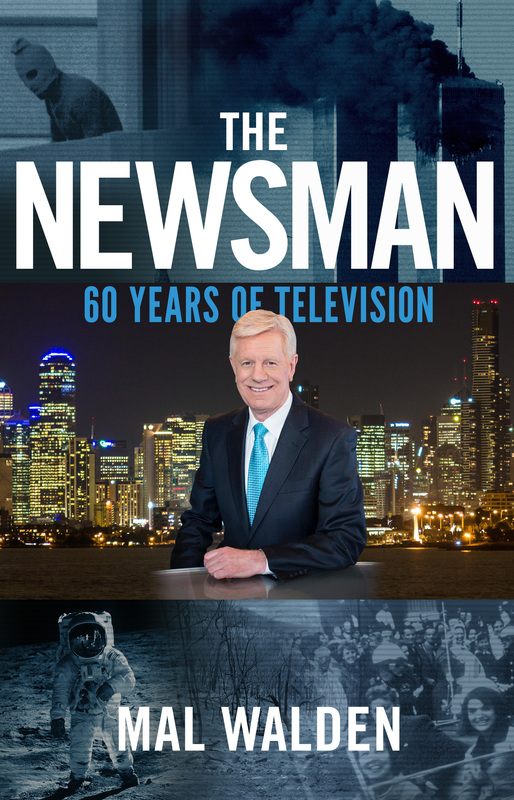 Mal Walden, author of The News Man (Brolga Publishing, 2017) and Good News! 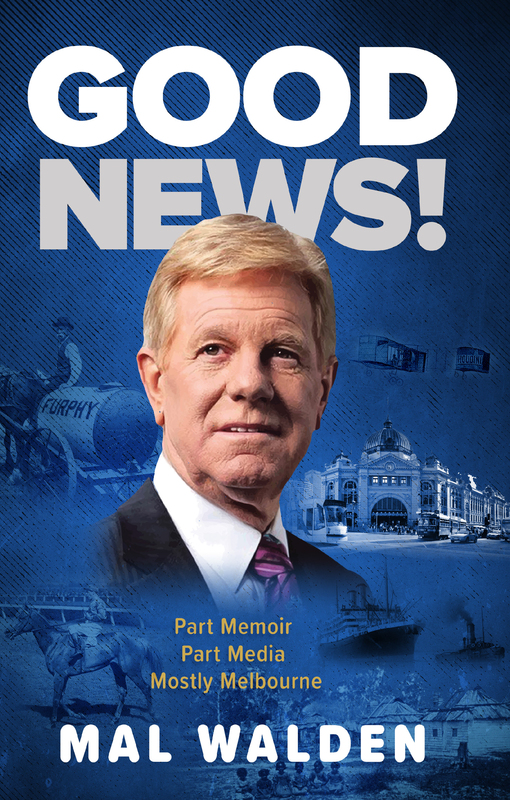 (Brolga Publishing, 2018) known most famously for his sixty-year career starting in country Victoria radio and then then shift to television as news anchor for channels 7 and 10 – retiring as one of most well-loved and respected news presenters of our time, will be attending and being a part of the speakers panel at Bayside Literary Festival! 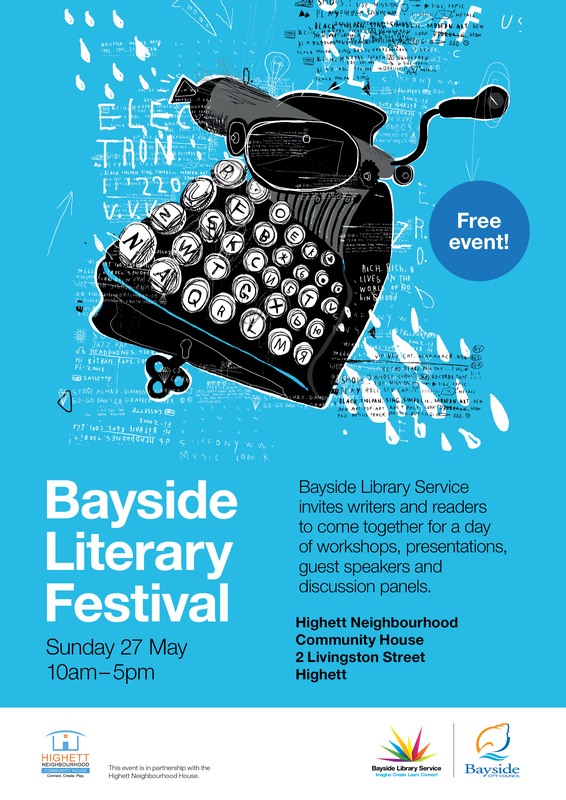 Bayside Literary Festival will be hosted on Sunday, 27th of May 2018 and invites writers and readers to come together for a day of workshops, presentations, guest speakers and discussion panels.Bayside Literary Festival is in partnership with the Highett Neighbourhood House. 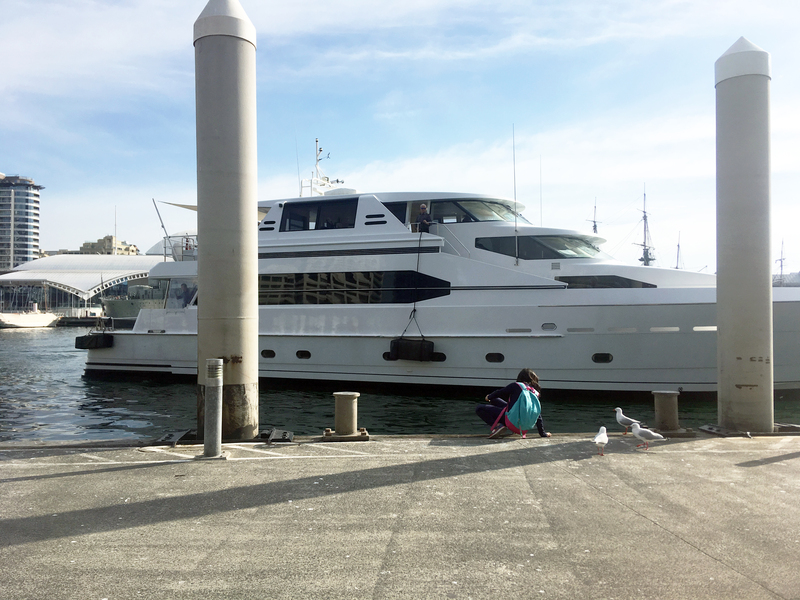 Enjoy a glass of wine, canapes and the delightful sound of the Bayside Chamber Orchestra whilst mingling with fellow writers and our special guests. 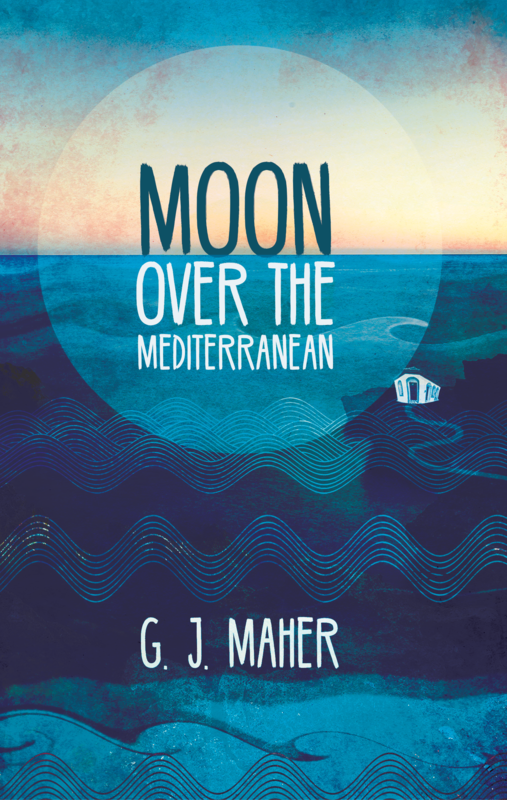 G. J. Maher of ‘Moon Over the Mediterranean’ to be interviewed on ABC Gippsland! There’s no stopping G. J. Maher! When he’s not stopping the public in their tracks with delicious chilli he’s fast gaining a solid fanbase and enthusiastic audience spanning the globe with his amazing, heartfelt and intrepid book Moon Over the Mediterranean! This coming Wednesday (May 23rd 2018) he will be sitting down with the Bec Symons of ABC Gippsland from 10:10am so tune in! I know we will be! If you haven’t yet found out what all the hype is about you can purchase Moon Over the Mediterranean at all good bookstores or by emailing markzocchi@brolgapublishing.com.au directly. 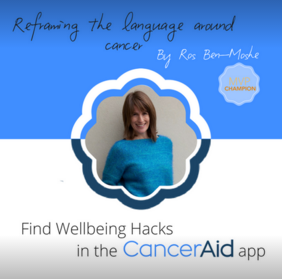 The indomitable Ros Ben-Moshe, author of Laughing at cancer (Brolga Publishing, 2017), La Trobe University Adjunct lecturer, Director and consultant with LaughLife Wellbeing Programs, motivational speaker AND survivor of bowel cancer – a shock diagnosis on her 43rd birthday – is now the newest Ambassador of CancerAid App. CancerAid – the number one cancer App in the US, UK and Australia, known for securing $500,000 with Shark Tank’s Andrew Banks and Glen Richards in 2017 and is used in 24 countries used by over 10,000 patients and caregivers. If you haven’t already got a copy of Laughing at cancer, it is available in all good bookstores and can be ordered directly by emailing markzocchi@brolgapublishing.com.au. 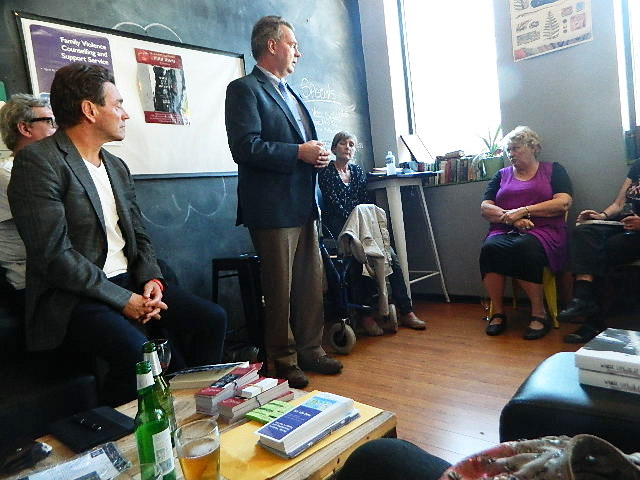 Brolga Publishing’s Mark Zocchi speaking @ Bayside Literary Festival! Rejoice! 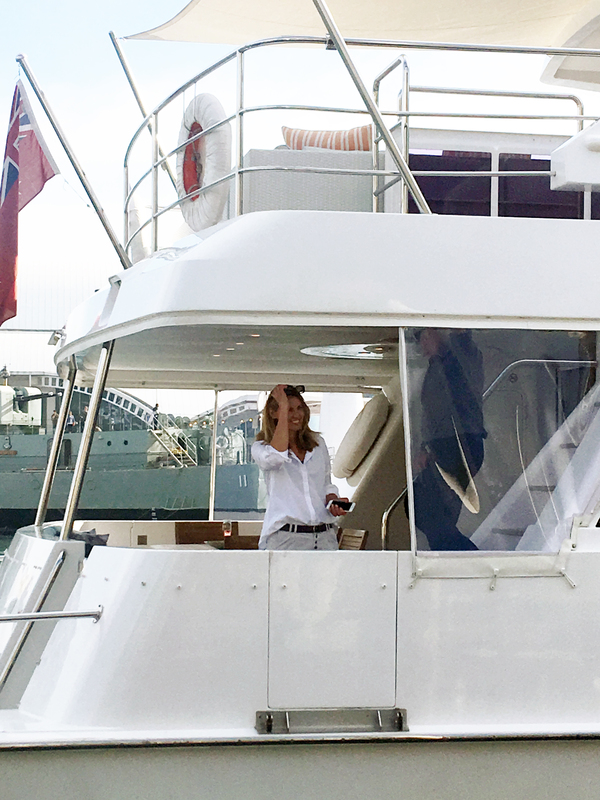 The Bayside Literary Festival is on again! 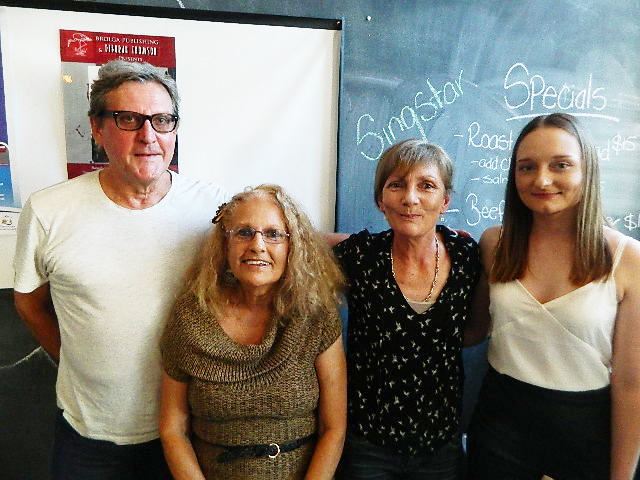 This is a fantastic local support and celebration for writers and readers alike come together for a day filled with workshops, presentations, discussion panels and guest speakers – this year our own Mark Zocchi will be speaking to the audience! Free event. No booking necessary. This coming Monday (May 7th, 2018) in Melbourne we’re very happy to announce Ros Ben-Moshe, author of the phenomenal Laughing at cancer (Brolga Publishing, 2017) will be speaking at Melbourne Jewish Book Week at the ‘Mind your Mind‘ event and panel alongside Elise Bialylew and Howard Goldenberg to have a chat and explore their stories, discuss the latest science around mindfulness and how it can transform your life. Definitely a must-attend event if you’re able! 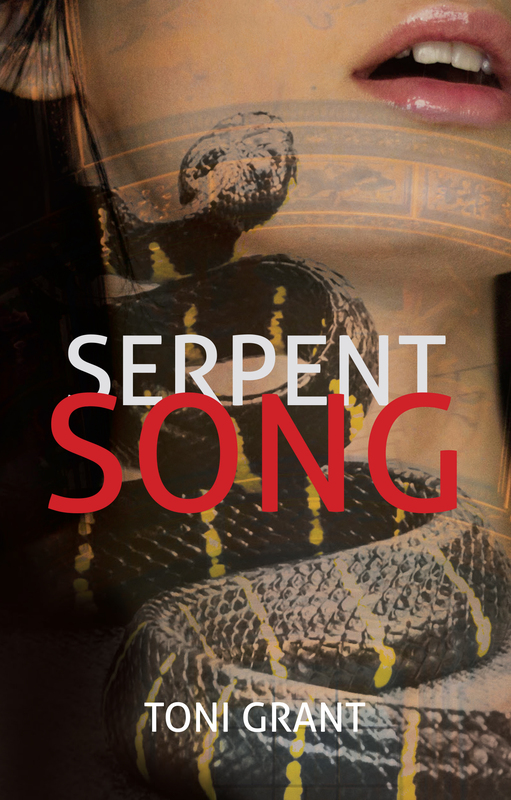 This event is hosted in the Ngargee Room, St Kilda Town Hall at 12:15 pm – 1:15pm. 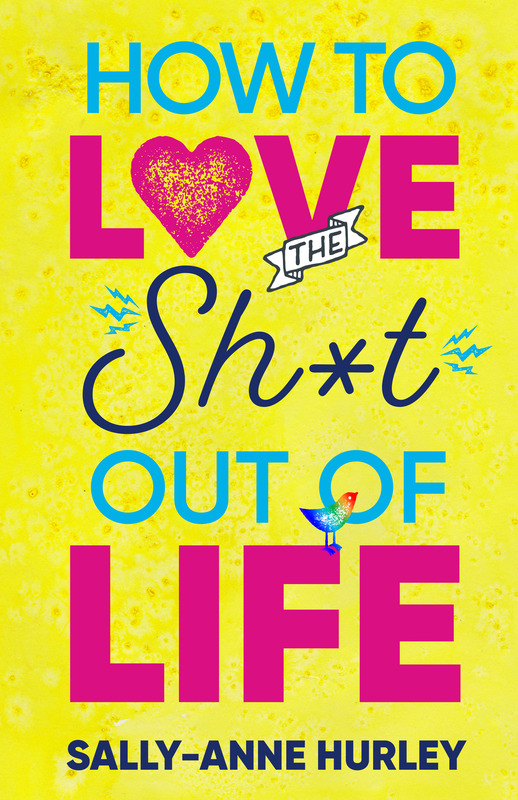 ‘Whose Life is it Anyway?’ Top of the list, tip of the tongue and talk of the town! 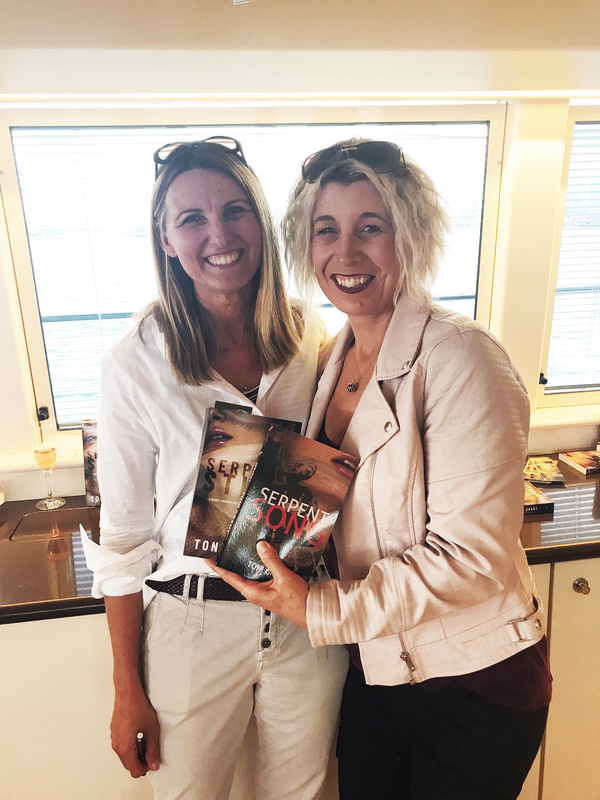 Deborah Thomson’s breakout first book about her personal experiences, meticulously documented through journals, in an abusive situation and the journey to freedom for herself and her children, the amazing Whose Life is it Anyway? 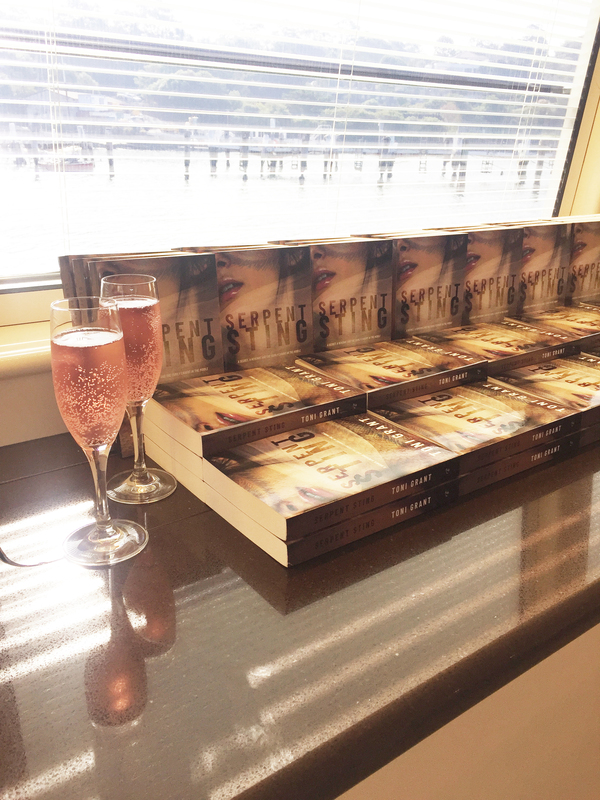 (which also features many current resources and excerpts from studies on the phenomena of intimate partner abuse and Australian support information) has rocketed up the list at Fullers Bookshop on their Non-Fiction list, securing No. 1 spot! 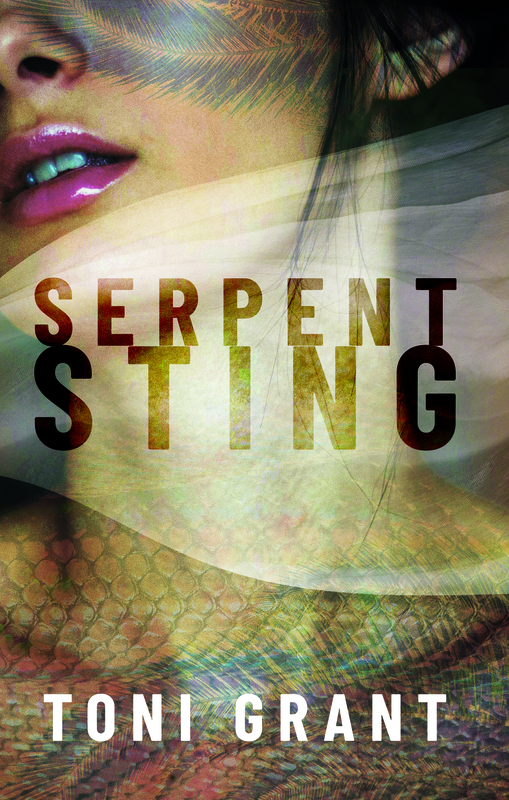 And not only is her book making waves, it’s also drawing amazing support as well! 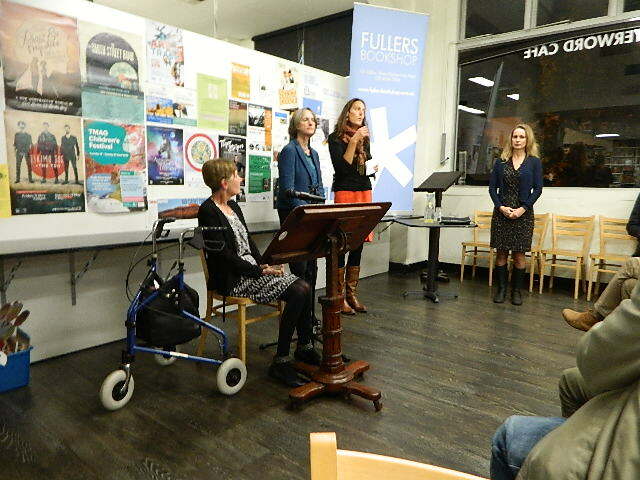 At one of her recent book signings her excellency governor Kate Warner attended and spoke of Whose Life is it Anyway? saying it was a unique and valuable resource for domestic violence services, after which she and her husband Richard very kindly donated 30 copies of Deborah’s book to Alina Thomas from SHE [www.she.org.au | Support, Help and Empowerment (SHE)] to be distributed to social services across Tasmania. Salvation Army also purchased 5 copies for their women’s refuges. 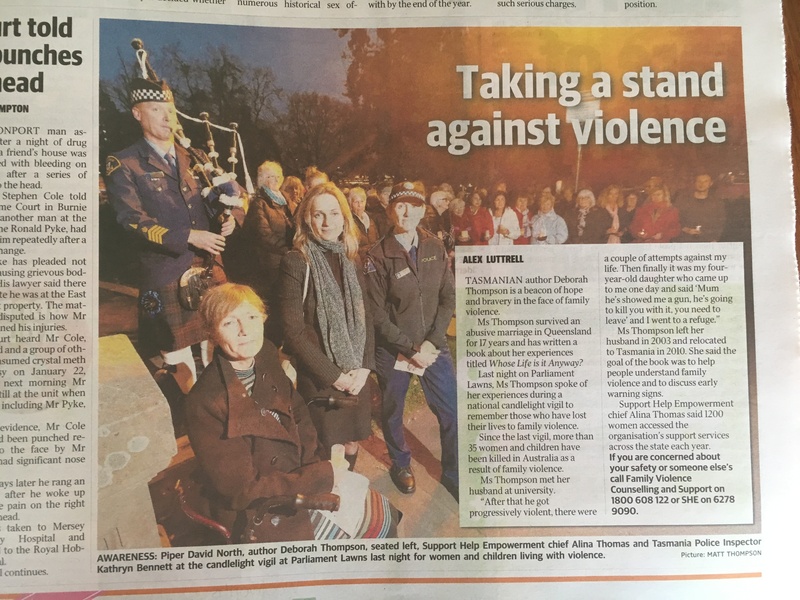 Unstoppable, Deborah Thomson also attended and spoke at a Candlelight Vigil on Parliament Grounds in Hobart against Domestic Violence, below is the Hobart Mercury Newspaper’s feature.